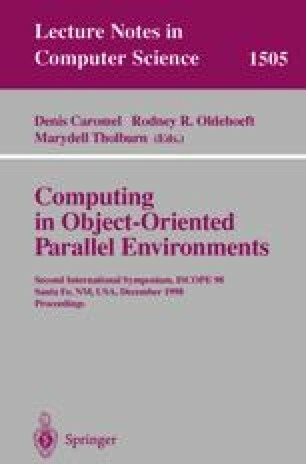 We present a parallel runtime substrate that supports a global addressing scheme, object mobility, and automatic message forwarding required for the implementation of adaptive applications on distributed memory machines. Our approach is application-driven; the target applications are characterized by very large variations in time and length scales. Preliminary performance data from parallel unstructured adaptive mesh refinement on an SP2 suggest that the flexibility and general nature of the approach we follow does not cause undue overhead. Supported by an NSF fellowship for a portion of this work. Beckman, P., Gannon, D.; Tulip: Parallel run-time support system for pC++ (1996), http://www.extreme.indiana.edu.